In the Northeast, the Raritan Central and Pennsylvania & Southern railways lead the way in providing full-service transloading backed by 24/7 operations and prompt customer service. Our extensive transloading infrastructure allows us to handle the demands of even the largest customers. 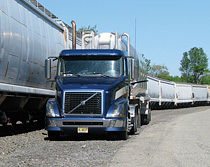 In total, we have over 300 active transloading and bulk transfer car spots. Supporting these are over 1000 storage-in-transit spots providing forward inventory positioning. Together these features give customers the advantage of knowing that they can always meet demands by having their materials available when they need them. Add this to the railroads' strategic locations and convenient highway access and you have the complete transloading solution for businesses dealing with bulk and liquid materials. 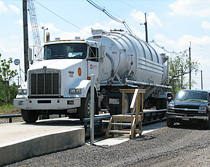 Customers who use our transloading and bulk transfer facilities enjoy the convenience of daily switching (with free additional daily switching), guaranteed car spots, on-site trucking and distribution services, and complete car/inventory tracking. They can also take advantage of our storage-in-transit capabilities free for the first 30 days.